Regardless of whether you’re using the viewfinder or Live View on your Rebel T6i/750D, your first focus task is to set the lens to auto or manual focusing (assuming that your lens supports autofocusing with the T6i/750D). On most lenses, including the 18–55mm kit lens, you find a switch with two settings: AF for autofocusing and MF for manual focusing, as shown in the figure. 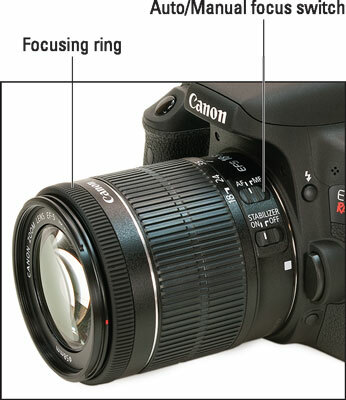 The position of the manual focusing ring varies from lens to lens; the figure shows you where to find it on the kit lens. On the kit lens, as on many Canon lenses, you set the switch to AF for autofocusing and to MF for manual focusing. Some Canon lenses do enable you to adjust focus manually when the lens switch is set to AF. See your lens manual to find out if your lens offers this option (the kit lens does not).